MORRISSEY GOES ROGUE (again) - Wisdom is the retention of innocence through adversity. 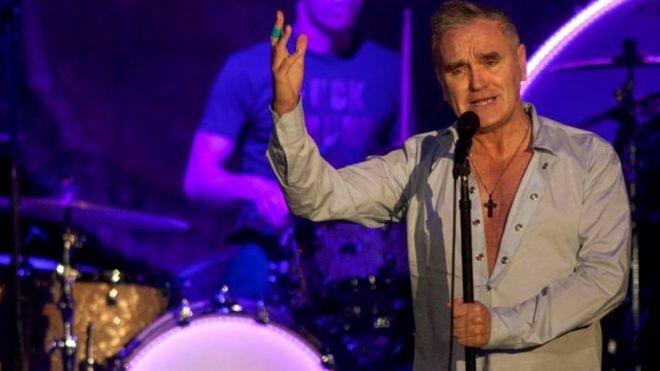 The former Smiths frontman – already infamous for his statements on race, animal welfare and more – criticised halal meat production, the Islamic method of animal slaughter. He claimed that “halal slaughter requires certification that can only be given by supporters of Isis”, and described it as “evil”. He also described Jewish kosher food production as “very cruel”, and called for it to be banned. Morrissey: Is it possible to separate art from artist? Yes, he has lost his Eraserhead Pompadour, and yes he's sometimes a vainglorious douche, and he's becoming a cranky old man, (and his last two records sucked), but a lot of people don't understand where his psycho-political 'duplicity' comes from. It comes from years of thinking things through, from the perspective of the marginalised outsider. In fact, maybe the reason why Morrissey has not yet been toppled by the UK phalanxes of the #metoo/et-al, movements, is that he is comparable to the populism of both Trump and Bernie - being both in and out, out and in - a Rubik's cube of views which doesn't match any one party or ideology, which is fine because that's what individualism is all about, right? Granted, I know he is incorrect about Hitler having been leftist. Apparently, he made the stupid mistake of thinking that since most political parties are the same, then its not surprising that Hitler was a National SOCIALIST... Actually, Hitler was doctored in by the standing government, and his right-wing movement, which also had sympathies with some stands by the left, took over the true leftist party, the NAZI party, and transformed it into something very right-wing. But, you don't expect an artist to be correct about everything, or to be an expert in history. He tries. But, other things he says, like being anti-ISIS or anti-immigration - these are not meaningless jingos to be discarded. There are cultural clashes between historical UK and incoming Moslems, especially the belligerent few. Much of the immigration is a result of Western wars and economics in the Middle East. More than this, in a world of rising climate disruptions and overpopulation, immigration will become an extremely serious problem globally in only a few decades. So, the issue or associated stances should not be dismissed so callously. [Morriessy sometimes like to incorporate a little Spanish music into his songs. It is a shame he hasn't been fully turned on to modern Arabic pop - I think this might soften his tone a little]. Morrissey began as a PUNK, enraptured in James Dean, and the crooners of the 50's. He is anti-establishment and will never be Knighted. Yet his heart is entrenched in a Romantic, wild, (AND Irish), past. He represents a clash of clutures which we can't normally see, but, being Irish, or being an immigrant myself, I know a little about it - certainly it is worse is more classist Britain. Regarding what he said about the Chinese: A lot of people are angry at the Chinese, including almost all of S.E. Asia. England humbly handed over Hong Kong to Communist China. It is understandable for some people to say rude or racist things about the Chinese. And, in fact, there are genetic differences between most Chinese and most Europeans. Morrissey may have been incorrectly thinking back to Homo Erectus instead of present-day Chinese Homo Sapiens, which was insane. But, again, he will always continue to throw out PUNKISH remarks just to retain his feeling of seperateness, independence and, alas, aloofness. He's a sad old narcissist, but at least of a different sort than all those who came before him. I suggest you follow this little article to see the other great Morrissey links there! He has put out writings and videos stating that he hates racism - and fascism. Earlier this week, in an interview published on his own website, Morrissey expressed support for the For Britain political party, which was formed last fall after its supporters were called “Nazis and racists” by former UK Independence Party leader Nigel Farage. Their policies, which include guidelines like “reduce immigration,” “end the Islamization of the UK,” and “protect British culture,” seem to track with Farage’s characterization. I just heard about this interview the other day. Very refreshing to see Morrissey breaking out of the entertainment groupthink echo chamber.